Story of a Poet: #40. Why did I write? – I'm Here; Right Here. Story of a Poet: #40. Why did I write? ¶ Quiet won’t mean I’m gone. ¶ Silence won’t mean I’m dead. What was with the night? And why did I write? Did I write because I had to? Or did I write because I loved to? Did I write to earn a fame? Or did I write to lounge a name? Did I write because I wanted to express? Or did I write because I wanted to impress? Did I write because it was my passion? Or did I write because of appreciation? Did I write because I had writing skills? Or did I write because loneliness kills? Did I write because people wanted? Did I write because I wanted people around? Or did I write because solidarity was my bound? Did I write to forget about my pains? Or did I write to drag it off through ink of pens? Did I write because of the suffering humanity? Or did I write to leave it all to insanity? Did I write because I had no other hope? Or did I write to maintain my life’s slope? Did I write to convince people? Or did I write to win a push_and_pull? Did I write because of the rummaging thoughts? Or did I write because of the complexity of naughts? 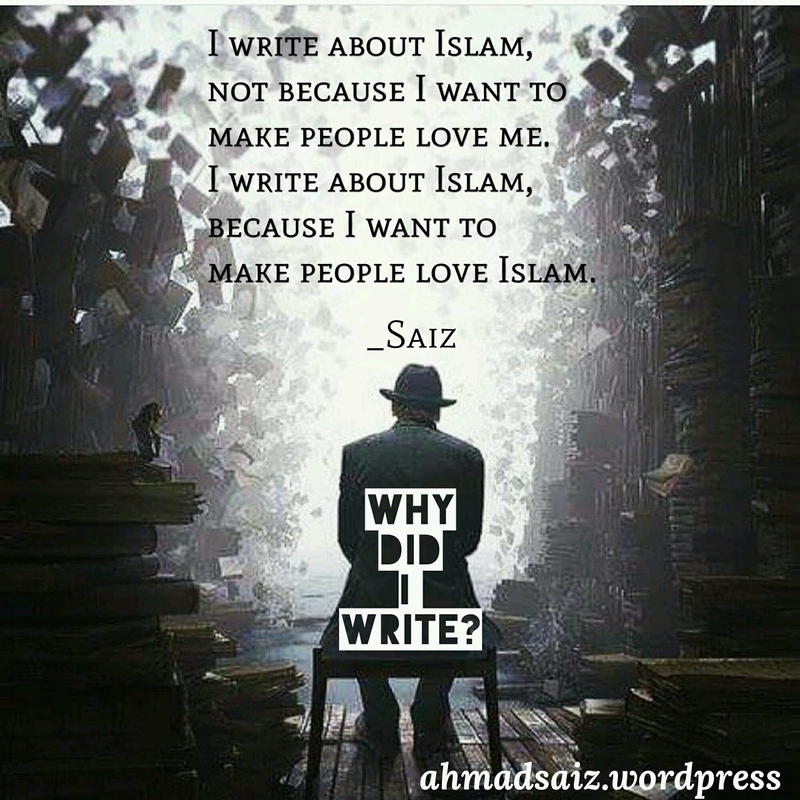 Did I write to teach Islam? Or did I write to boost my Imaan(faith)? Did I write because ★I’m Here; Right Here★? Or did I write because ★I’m There; Nowhere★? Streaks are made to be broken; and so the question goes unanswered. Taking the job and being a responsible blogger is what I fancy the most because I had always believed in the fact that what one writes has to benefit, either the reader, or the writer’s self. Story of a Poet: #39. What if I die tomorrow? I want to see your initials..! The steps which urges us to write are the golden moments. You are wonderful writer.. Keep writing 🙂 I just joined the blog and to write about Islam is an opportunity to love the true side of it..wish you a very happy Ramadan! Thank you for your presence. I would love it if I could be of some help to you. Sorry for a late response. I logged in after long time. It is great to hear a response from an incredible artist. Your writings are definitely helping me. Don’t apologise, I am also not been on this site for so long. Now wanted to join it again. Will read your future ideas on the page of your thoughts. Hopefully I’ll be starting full-fledged at end of November because of an entrance exam. But, you shall start any sooner. Thanks! Will see you soon with shining notes again! Thank you for this honor. I am fan of his already. You can check Urdu Poetry section at my blog to be sure. After reading this, I have got irresistible urge to share my poem that i wrote for magazine. i hope you will like it. I just hope you don’t get any.